As we recently reported, over 85% of physicians now have a smartphone, with the iPhone leading the pack. As with many things, the increased use of this technology poses some risks and challenges to security. A report from Larry Ponemon, PhD, chair and founder of the Ponemon Institute, outlines his first study on patient privacy and data security and the results are intriguing. Ponemon found that 96% of all health care organizations surveyed had experienced at least one data breach in the past two years. While the report did not specify the percentage of breaches from mobile devices, it did mention that widespread use of mobile devices is putting patient data at risk. The study looked at only 72 health organizations. Many healthcare organizations have struggled with the increase in demand of physicians who want to access their smartphones to access patient records as well as their organization’s EMR. Because of HIPAA laws, the security of patient information is tantamount and as such, healthcare organizations need to to do a better job of making sure the information is secure. Lynn Vogel, PhD, chief information officer and vice president of University of Texas MD Anderson Cancer Center in Houston, explains that early versions of certain smartphones aren’t capable of being encrypted and secured properly, so physicians can’t use them to connect with the hospital’s data centers. One of the easiest ways that a physician can ensure that data is secure is by using encryption software on their smartphones. Recommendations from their respective IT personnel can provide the correct encryption tools to match the organization’s systems. 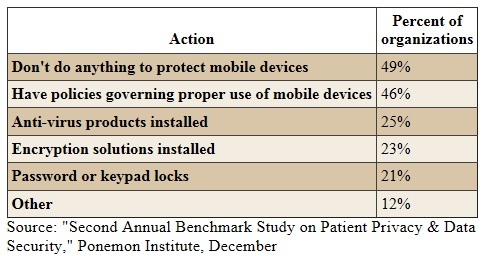 However, the Ponemon survey discovered that only 23% of healthcare organizations use mobile device encryption. Additionally, the survey also found that almost half of the healthcare organizations queried do nothing to protect mobile devices, an alarming number to say the least. Reinforcing policies on data security and understanding the consequences of data breaches can go a long way in helping to ensure patient data is secure. I’m no security expert, but this “report” seems to aim at making mobile devices look like the most dangerous thing ever invented. “Data can reside on the device and can be accessed” — In this day of age, everything should be remote / cloud access based. Anyone ever heard of a system on which patient data is downloaded to the device? I think it’s really important to keep in mind the security of your mobile device. I personally would not keep any patient info on my device. If I’d be using it to access personal data, I would protect it with a passkey and / or a password. Anyone with an iOS device should enable “Find My iPhone”. If you loose your device, you’ll be able to remote wipe it yourself.